Originally published in 1992, this classic method book garnered praise from top drummers and educators. Now the author has updated it with additional exercises and online audio examples. Designed to develop coordination in a groove context, Time Manipulation features an open format that favors exploration. The bulk of the exercises consists of sets of one-bar beats, where a simple groove builds in complexity. What's special is the relationship between the simple and complex grooves, and the related patterns in between therm. They can be mixed and matched, ostinato ride patterns can be swapped in, bass drum phrasing can be altered, and more, allowing for a lot of creative exploration. The collection of phrases in both 4/4 and 12/8 develops a solid foundation in groove, along a spectrum from simple to complex. 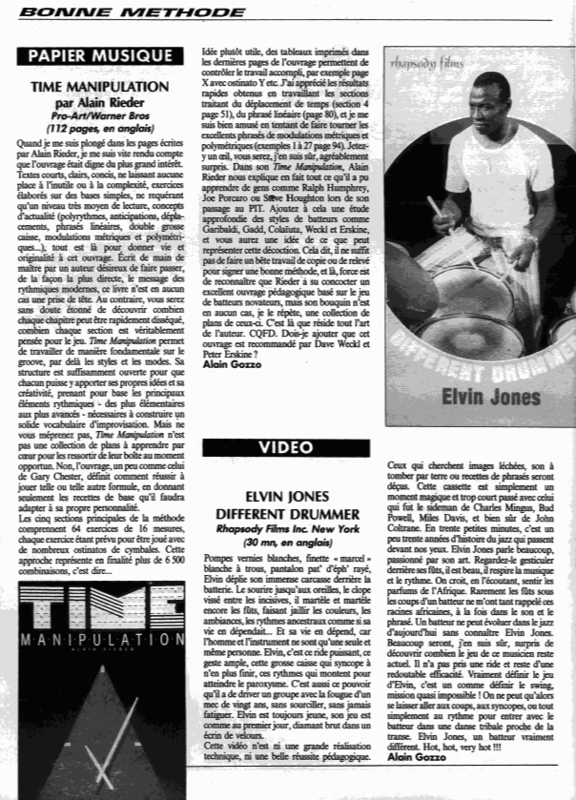 In this extended, new edition of the textbook "Time Manipulation", first published in 1992 and available in English and French, the renowned drummer and author Alain Rieder introduces the world of the rhythmic effect of grooves in an innovative way. Alain Rieder uses exercises with selected, structured patterns, ranging from absolute basics to very complex "time manipulation" and "rhythmic modulation" exercises. 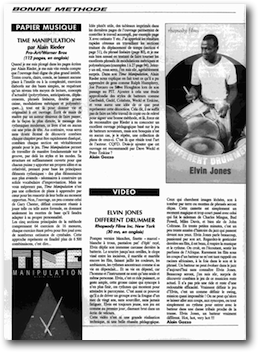 The book is designed to work on the coordination of drumming within a groove context. The total of 67 exercises in chapters 1 - 6 consist of 16 single, one-bar notated patterns, each played twice. Each exercise should be performed in the order indicated. The exercises themselves do not have to be done from 1 - 67, but can be learned individually. The way of working with this book is explained in detail in the introduction. The chapters ("Sections") 1 - 6 deal with basic patterns, polyrhythmic patterns, anticipations in eighth and sixteenth notes, beat displacements, 12/8 patterns and swing & shuffle feelings. Chapter 7 then deals in detail with the "Rhythmic Modulations", for which the previous chapters prepare excellently. A summary list of all exercises concludes the book and makes it easier to find the audio files of the individual exercises available for download on Alain Rieder's website. Although the book starts with simple basic patterns in the first exercises, the overall concept is aimed more at advanced and professional drummers who want to work on their rhythmic vocabulary and gain a deeper understanding of the rhythmic effect of groove patterns that they actually feel. Also to be recommended is the concept of this textbook as study-accompanying content in drum lessons, because its didactically coherent form and uniqueness make it a real enrichment of a practice plan. These practice-oriented contents were already up-to-date in 1992, and they have remained so to this day. It is very good that this classic textbook is now being published in an extended new edition. 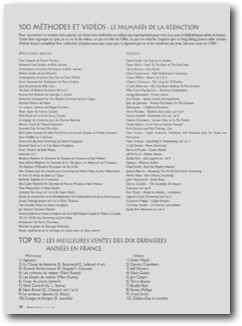 In 1997, Time Manipulation was listed by Alain Gozzo as part of his "Ideal Drummer's Library", among 40 other drum books and 60 educational videos. For students who are not quite ready for Gary Chester's The New Breed, this book could prove the perfect introduction to some of it's concepts. Time Manipulation begins by introducing a series of ostinatos for the hi-hat or ride cymbal (and sometimes hi-hat pedal) that are comparable to Chester's "systems". Granted, there are no instructions indicating that one should play them with both left- and right-hand lead (sic), but there is nothing to stop someone doing that, either. Following the ostinatos are over fifty pages of exercises with various bass drum and snare patterns, each of which is to be practiced with each of the ostinatos. Had Rieder have written all of the exercises out, the book would have easily filled several hundred pages; by simply printing the basic exercises once and listing all the various ride patterns that can be played with them, his book covers a lot more ground than its 112 pages would indicate. Whereas The New Breed's reading exercises are great for developing reading and technique, individual measures do not always make practical drum beats. Time Manipulation, by contrast, offers one-bar patterns that are very realistic in terms of potential for everyday use. They progress logically in difficulty from simple quarter and 8th-note patterns to 16th notes and 12/8 time. Because it starts with a basic 8th-note ride pattern,the book can be used as a beginning drumset method. By the end, the student will have a good command of a variety of time feels. 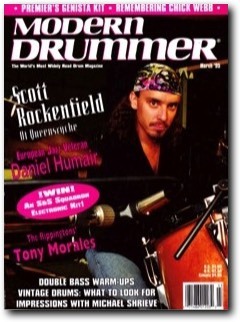 Rick Mattingly, Modern Drummer, March 1995. When I immersed myself into Alain Rieder's book, I quickly realized that it merited the greatest of interest. Short, clear and concise texts, with no useless frills or complications. Exercises elaborated on simple bases, which require a very moderate reading capacity. The concepts are up-to-date (e.g. 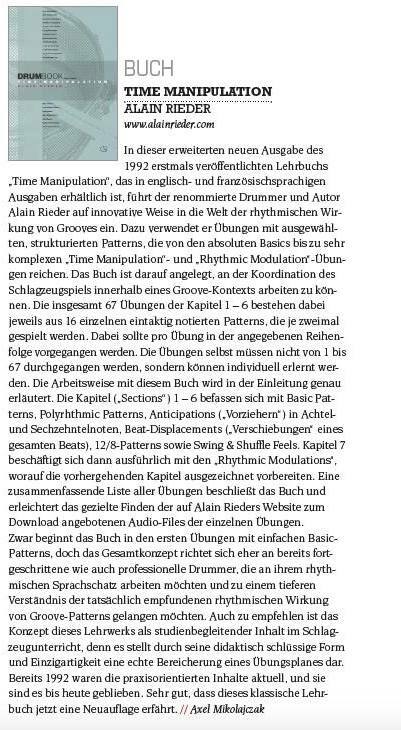 polyrhythms, anticipations, beat displacement, linear phrases, double bass-drum, metric and polymetric modulations). It has everything to give it life and originality. Masterfully written by an author willing to share the message of contemporary groove playing, in the most direct way possible, this book is a pleasure to work on. You no doubt will be surprised to discover how each chapter can be easily dissected, how each section is carefully thought out for playing. Time Manipulation allows one to work directly on grooves, beyond any single style or trend. It has an open structure which allows the player to apply his own ideas and creativity. "Time Manipulation presents the principal elements - from the most elementary to the most advanced - necessary to construct a solid vocabulary for improvisation. But don't read this wrong. Time Manipulation is not a collection of licks to learn by heart and take out of their box at an opportune moment. No, it is somewhat like Gary Chester's book in its way of defining how to successfully play some combination or another; it only gives the basic recipe and leaves it up to the player to adapt it to his own personality"
One quite useful idea is that logs are provided on the last pages so that improvements can be checked, e.g. page X with ostinato Y, etc. I was most pleased with the quick results I got working on the exercises dealing with beat displacement (Section 4, page 51), and linear phrasing (page 80). And I had great fun trying to play the excellent metric and polymetric modulation patterns (examples 1|27, page 94). Take a glance. I'm sure you will be pleasantly surprised. In Time Manipulation, Alain Rieder explains what he has been able to learn from people like Ralph Humphrey, Joe Porcaro and Steve Houghton when he was at PIT. Add the thorough study of drummers styles, like those of Garibaldi, Gadd, Colaiuta, Weckl and Erskine, and you will have an idea of what this book actually means. But it is not enough to just copy and transcribe in order to produce a good method. And this is where it becomes obvious that Rieder has concocted an excellent educational book based on the playing of innovative drummers. But, as I said before, the book is not a collection of these drummers' licks. That is where the author's art is essential. 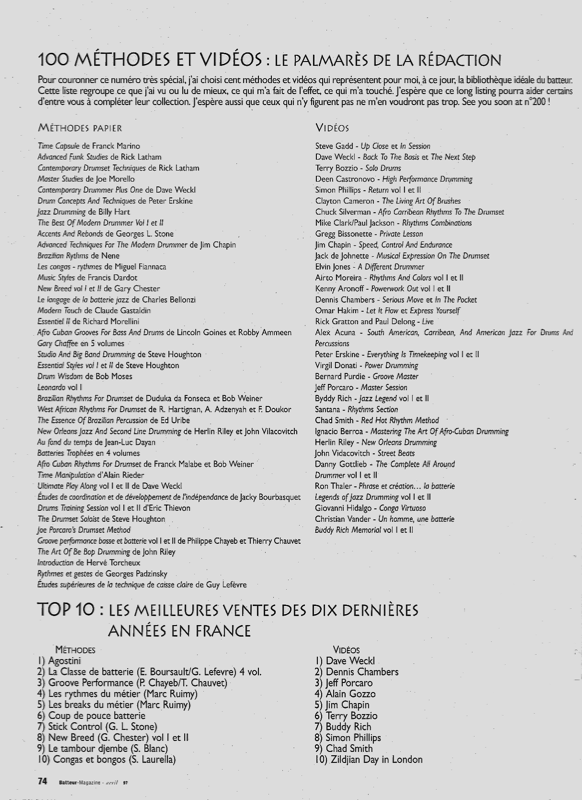 Alain Gozzo, Batteur Magazine, January 1994.